Good news! Little Margie has found a home. She was adopted on Sunday by a wonderful couple with two little Bichons. How great for her and what a fantastic life she can look forward to. 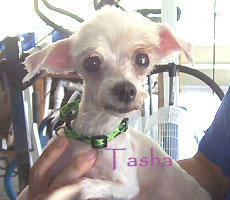 Little Tasha is still available, as are Pepper and Adrian, and here's her picture. What a sweetie pie and she sure could use a good home. Please contact our friends at Lost Angels to find out more about this little gal. Happy Gardening.